The Sunbed Hire Directory work with our partners to offer both Vertical and Horizontal Commercial Tanning Sunbed units, from the World's leading Commercial Sunbed manufacturers. All our commercial sunbeds are fitted with a choice of tanning lamps ranging from 160w to 225/235w/250w, again the best suited to you and your clients' needs will be selected. Whatever your business we have a wide choice of Commercial Sunbeds available to suit your specific requirements. 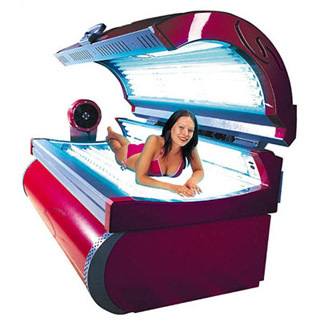 Vertical Tanning Commercial Sunbed Units with free changing cubicles are also available if necessary. We have Commercial Sunbed equipment solutions for all types of locations and spaces. Our agents and engineers have installed commercial sunbeds in a whole range of premises from small High Street units to top Hotels, Local Authorities and Leisure facilities. Working with our partners we will help you to choose the best system for you. It is important that you choose the right commercial sunbed brand from a company that offers full back up support to keep your commercial sunbed units serviced. Those who visit a salon to use a commercial sunbed are very discerning. The sunbed has to look right, it has to look like the latest product. If it's not effective visually, they will not use the sunbed. If the sunbed you hire looks attractive visually and they use it, and find that the performance is not as good as they expected, they will go elsewhere. So be sure to choose the right company to supply you with commercial sunbed equipment. There are many schemes available for those looking to install a Commercial Sunbed. One of the most popular is Lease Hire however you can also hire or purchase a new or nearly new commercial sunbed. 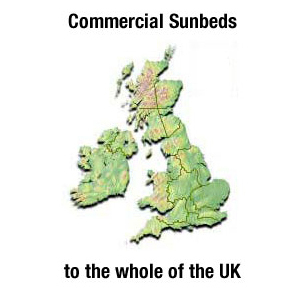 So why should you arrange your commercial sunbed with The Sunbed Hire Directory. Well we are a long established reputable company with an excellent reputation based on service and quality. we only work with select partner companies who share our business values. The Sunbed Hire Directory are also committed to promoting the Sunbed Industry for the benefit of the whole industry from Manufacturers, to Commercial Sunbed Hire Companies, and to the end user such as the sunbed salon owner. This is achieved via high profile websites which feature high on the search engines such as Google, Yahoo and Bing. It has a high-powered ceiling fan and body cool jet system, offering superb cooling for client comfort and ensuring that the lamps function at optimal temperatures for improved tanning performance. Sunquests Zenith lie-down sun beds are ergonomically designed for superb tanning performance and offer an amazingly broad reclining surface. Durable, coated steel construction, enveloped in moulded, metallic high finish, acrylic that retains its finish in everyday salon life. The Zenith lie-down sunbeds - Blends strength and durability with style and customer appeal. Designed to complement that Aurora Vertical tanning units. State-of-the-art cooling system (8 powerful fans) and body breeze fan ensuring optimal running temperatures of tubes for shorter tanning times. Simple. You just hire a Commercial Sunbed. Terms, Contracts and Agreement subject to application and agreement by all parties. We can supply a full range of Brand New Commercial Sunbeds from the leading manufacturers. There is a great choice of Nearly New Sunbeds that are for example ex-display or from Salons who have upgraded their commercial sunbeds, or have stopped trading. Huge Savings are available, and all the profit from your purchased commercial sunbed is yours. So contact us now. Visit the Contact Page, complete and we will call / email you within one hour during office hours. HOW MUCH IS MY INITIAL INVESTMENT? There is a non-refundable installation fee per Commercial Sunbed unit payable prior to installation along with a security deposit. These can be discussed at the initial enquiry of your commercial sunbed. Any negligent damage to the commercial sunbed units i.e. smashed perspex will be charged to the client. Maintenance can be discussed prior to contract. WHO IS RESPONSIBLE FOR THE ELECTRICAL COSTS? You are. All electrical costs are the clients responsibility, the wiring of the sunbed tanning units will be completed by our qualified engineers. HOW MANY COMMERCIAL SUNBED HIRE UNITS COULD WE RECEIVE IN THIS PROGRAM? HOW MUCH DO I CHARGE PER SESSION? This will be agreed prior to installation between the client and ourselves and will depend on the location, local competition and target market. Please get in touch with us to discuss how we can help YOU start your Sunbed Salon, or replace your existing equipment. 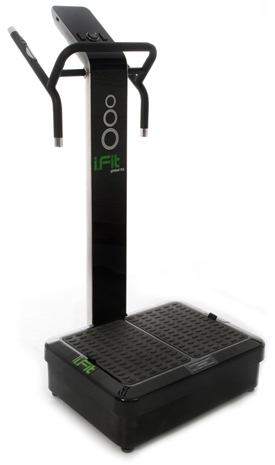 The Sunbed Hire Directory can also supply the amazing i-Fit Power Plate for Commercial salon use. Those salons that have installed these products have enjoyed great success. The Sunbed Hire Directory would be happy to provide details of these salons for reference. These machines are really eye catching and will add another dimension to your salon. The i.Fit makes the muscles contract and relax up to 50 times a second, giving the body a high speed workout. Other machines use either vibration or oscillation, i.Fit has two motors - so uses BOTH. As the i.Fit plates move up and down, they also vibrate in a way specifically designed to stimulate and trigger the muscle walls. The body then tries to stabilise itself by contracting muscles - so ultimately it has to work twice as hard - which gives you better results. All i.Fit machines have two motors. One that powers the oscillation motion and one for the vibration motion. Oscillation, which is the up and down motion, will give the body a resistance work out. The body will try to correct itself, fighting against the motion, so as one limb moves up, the other limb moves down allowing the bodies' natural shock absorbing system to operate. The forces are dissipated by the pelvic girdle, thorax and lumbar spine. Improvement in bone density, making the bones become stronger. Increases the metabolic rate - the best way to lose weight.